Some caravanners get a little sniffy about special-edition caravans, recalling little that was meaningful offered in the 'special' asking price above and beyond different trim. But the latest crop of dealer specials are just that – special – and the Swift Freestyle SE range offered by Midlands dealership Lowdhams is a case in point. It’s based on the popular Sprite, so it’s modern, lightweight and aimed at first-timers or young families. There are six models, ranging from two-berths to six-berths, plus a range-topping twin-axle with a French bed and end washroom. The model we’re looking at, the Swift Freestyle SE S 6 TD, is probably the most family-friendly of the lot. It’s one of two models in the line-up to not feature a full-width end washroom (the other being the French bed S 4), and while it can sleep six, it’s likely to appeal to young families with two children. The Freestyle SE S 6 TD is noticeably dearer than the standard Sprite Major 6 TD (RRP £15,525), but the specification is much higher and claims to offer more than £1300-worth of kit for the asking price. From the glossy white finish to the tasteful graphics and alloy wheels, this is a modern-looking tourer. But there are clues to its budget roots, not least of which the single front window and the lack of a window in the door. But it’s well thought through elsewhere. The corner steadies are easily reached, and the hitch head is equipped with an Al-Ko AKS 3004 stabiliser. Enormous grab-handles make manhandling it a breeze, too, while most of the exterior services, including the toilet hatch and battery box, are banished to the offside wall. Extra kit from the Freestyle SE pack includes an external 230v mains socket and gas barbecue point. The grey water drains are close to the axle line – so drainage should be quick, even if your levelling skills need a little polishing. And there’s exterior locker access to interior storage on both sides. At 24ft 6in in overall length, and 1502kg all up, you’re going to need a fairly beefy tow car for the S 6 TD to achieve 85% matches – 1767kg of tow car, in fact. Inside, there are few hints to the Freestyle SE’s humble DNA. The S 6 TD has standard parallel front settees with the usual chest of drawers in the middle, but the dark wood, chrome-effect fittings and expensive-looking soft furnishings make it look anything but budget. The light admitted to the TD’s interior is impressive. That single-piece window floods the lounge with daylight. Factor in the additional panoramic sunroof overhead and the large rooflight a little further back, and the S 6 TD feels bright and airy, even when it snows! Children will love the separate lounge/play area adjacent to the fixed bunk beds. There’s room for three in there, and the little cupboard in the centre of the rear wall also houses the power sockets for MP3 players and games consoles. This area can be partitioned off. Mum and dad get a premium CD/radio with MP3 connectivity, too. The galley is the heart of any family van, so the TD needed to get it right. And it has. The lift-out drainer opens up plenty of worktop space, but if you need more preparation space then there’s a large extension flap. Standard kitchen kit extends to a Thetford hob with three gas burners and a separate oven and grill, plus a fridge and a high-level microwave oven. Cream roof locker doors gives contrast, and the ceiling pelmet, with its inset pin lights, looks classy. The centre washroom is a cracker. There’s no window, but there is a fully-lined, separate shower cubicle. Space around the basin and swivel toilet is slightly above average. It’s well-lit and the mirror is huge. At 5ft 11in, the offside settee is the shortest single bed in the van, but that’s pretty generous. The nearside sofa is longer – 6ft 3in – and the whole converts into a jumbo-sized double bed measuring 6ft 8in by 5ft 11in. Each fixed bunk is 6ft long and has its own window and reading light, while the upper berth gets a deeper side panel to ensure its occupant doesn’t roll out of bed. The nearside sofa is best for storage, because it is broadly empty and offers exterior access and a wet liner. That on the offside is compromised by heating ducts, plumbing and the main control centre and fusebox. The kitchen has a large locker to the right of the microwave and a dedicated crockery cupboard to the left. There’s a pull-out veggie rack and a large cutlery drawer. Some overhead lockers get fitted shelves, they are all a good size, and all have positive catches. 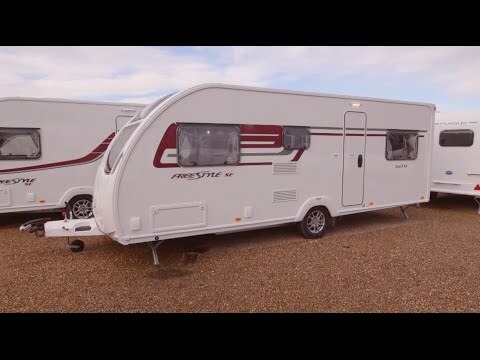 The Swift Freestyle SE S 6 TD special edition caravan from Lowdhams is a modern, well-equipped, versatile and practical family tourer, and one that takes all the virtues of the standard Sprite Major 6 TD caravan and factors in a healthy dose of luxury. The price seems steep compared to the RRP of the Sprite on which it’s based, but the kit levels do reflect this. And the layout is pretty much spot-on for families of four-to-six people.